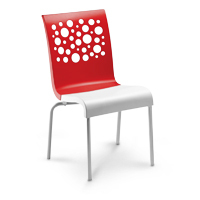 Unique, two-color resin designer stacking chairs with a fun personality and European design. Strong aluminum legs and hard wearing footpads provide extra stability. 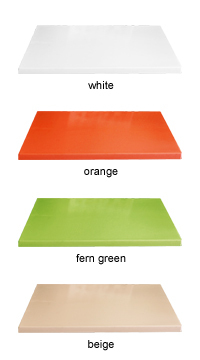 Matching molded melamine tables available are listed in the price chart. 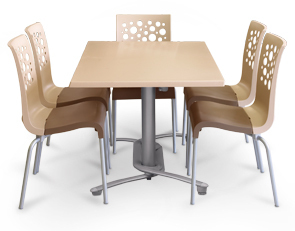 These indoor use stacking chairs are specifically designed for versatility of use in many contemporary environments. 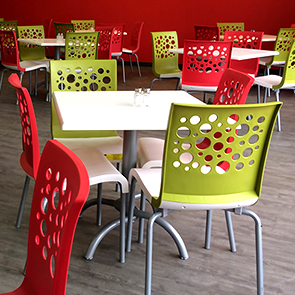 Perfect for food courts, cafeterias, airports, shopping malls, hospitals, colleges and more. Tested in accordance with and pass each test procedure utilized in ASTM F 1561-96 Class B performance standard for commercial outdoor seating. Stacks for easy storage. Easy to clean with soap and water. Measures 22"L x 21"W x 34-1/2"H. Seat height measures 17". Easy to clean, strong and sturdy molded melamine table tops available in 24" x 32", 32" square, and 30" round. Burn, UV, stain, scratch, and heat resistant. Heavy-Duty powder-coated black or silver gray aluminum construction bases for weather resistance and structural integrity. Two adjustable leg levelers balance table base on uneven surfaces. Easy to assemble. Easy to secure with metal chain and padlock for storage. Folding lateral base is made to support the 48" x 32" table top.